Over the past few years I've been trying to bring a different vision to clawhammer banjo by providing a free learning site that encourages the exploration of clawhammer banjo in genres other than "old-time" music (although I include "old-timey" music as well). I'm now attempting to push the boundaries even further by exposing young players to music they might otherwise have never considered attempting on their banjos. To accomplish this, I'm trying to enlist the help of some progressive minded acoustic artists by getting their permission to include their work in this special “Progressive Clawhammer" project. Once again, the idea is to introduce clawhammer players to the music (and arrangements) of all types of progressive minded musicians. 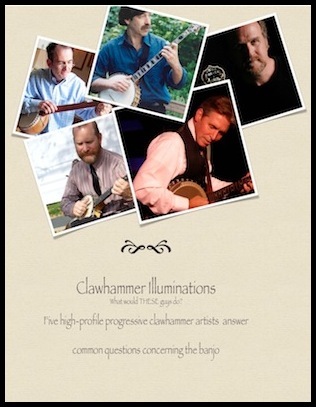 This will include clawhammer players such as Michael Miles, John Balch, Ken Perlman, Mark Johnson and Mark Schatz . At the same time, I want to encourage young frailers to tackle music from progressive players of other instruments (David Grisman, Tony Rice, Bela Fleck, Jerry Douglas, Mike Marshal, Norman Blake, Tim O’Brien, etc.). As soon as I receive permission from the artists, I'll post video footage, sound files and possibly some tablature. I will also include links to the artists' respective websites. I’d encourage all my readers to listen to (and purchase) the recordings of these musicians. You should also check out the other resources (books, DVDs, etc) that they may have made available to you. Insightful answers to banjo related questions provided by Perlman, Johnson, Balch, Miles, and Iverson.